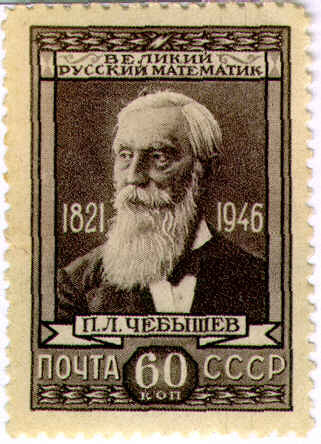 The Russian mathematician Chebyshev made important contributions to number theory, probability theory, and function approximation using orthogonal polynomials. 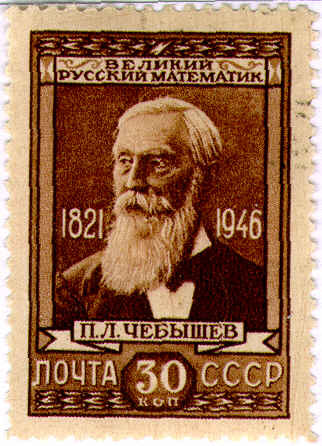 Although younger than Lobachevsky, Chebyshev was considered a rival. 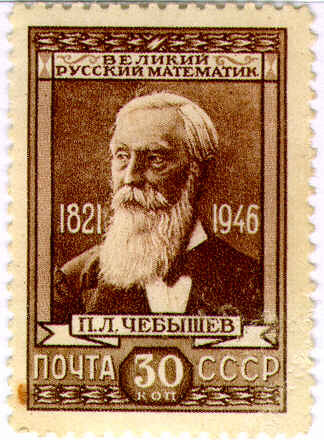 While Lobachchevsky was isolated at Kazan, Chebyshev spent his career at St. Petersberg, where Euler spent much of his life; Chebyshev is considered the founder of the St. Petersberg school of mathematics, and his mathematical descendants include Markov, Lyapunov, and Kolmogorov. His work was well-known in europe since he published in european journals and made several extended trips to european mathematical centers; he was eventually elected to many foreign memberships including the Royal Society and France's Academy of Sciences. His mathematical legacy includes Chebyshev polynomials in approximation theory, the law of large numbers in probability theory, and almost a proof of the prime number theorem. Let be the number of primes less than or equal to x; Gauss had guessed that (this is the prime number theorem). Chebyshev showed that together with the fact that the limit must be 1, if it exists.